THE ULTIMATE JAZZ DRUMS SET FOR YOUR KIDS:Do your kids love music? Do you wantto help them develop theirmusic skills from a very young age? 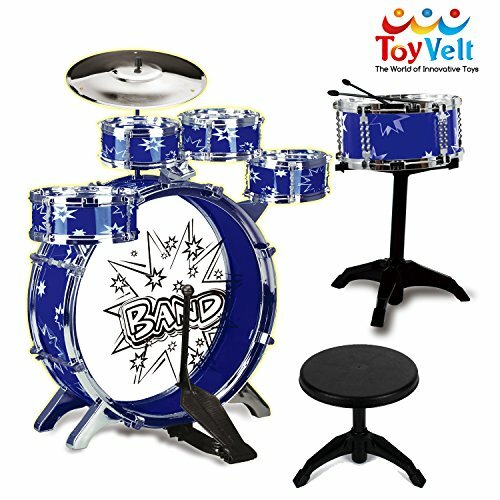 Toyvelt presents you with the 12-piece kids'drum set, a jazz instrument kit that includes 5 snare and bass drums, a cymbal, a chair, a comfortable kick pedal, 2 drumsticks, and a sturdy stool.Thismay be a toy, however, it is so realistic and well-madethat it looks like an actualprofessional drum set! FUN AND EDUCATIONAL AT THESAME TIME:Your kids are going to love making music with theirnew jazz drums! However, this drum set will not only develop their music skills. Jazz drums are perfect for stimulating children's creativity, motor skills, and eye-handcoordination. In other words, apart from learning how to make music, your child is also going to develop otherperformanceabilities and cognitiveskills that are essential for their future life. UNLIKE MOST TOYS, THISONEWILL NOT BREAK:You know the drill. You give your kids a new toy and after a couple of weeks it is broken and useless. Thiswon'thappen to this kids'drums, because they're made with premium quality materials. More specifically, Toyvelt has used sleek chrome rims, durable plastic, and thickhardwood in order to ensure the longevity and safety of this kids'musical toy.This kids'instrumentis an investment you won'tregret. THE PERFECT GIFT FOR 3+ YEAR OLD KIDS:Are you looking for a gift for your son, daughter,nephew, niece, little cousin, godchild, grandchild, or child of a friend? Look no more, because this kid drum set is the coolest gift that you could give to a childthat is 3 years old or older! So give them the drum for kidspackageand watch them while they open it. We're 100% sure that the look on their face will be that of complete excitement and enthusiasm! YOUR SATISFACTION IS OUR TOP PRIORITY: Are you unsatisfiedwith the electronic drum set for kids?The Toyvelt children's jazz drum setis under a 100% money back guarantee that ensures your complete and utter satisfaction.In the unlikelycase that you or your child won'tbe happy withthe amazing jazz drum instrument kit, we will refund every last penny, no questionsasked. So get the Toyvelt little kids drum set today and try it out risk free!